Non-profit companies incorporated for a public benefit objective or an objective relating to one or more cultural or social activities, or communal or group interests, established under statutory law. 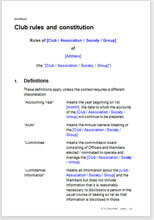 This is a constitution or set of rules to regulate your management of any straight forward club, society, association or other non registered organisation. You can use it to manage a charity - remember to register it with the Department of Social Development. It is not suitable for a co-operative society. Of course you want to be sure that the constitution covers everything you needs but does not go over the top in an unnecessarily long document. This is a simple and general version in plain English.